"Power grid" redirects here. For the board game, see Power Grid. Early electric energy was produced near the device or service requiring that energy. In the 1880s, electricity competed with steam, hydraulics, and especially coal gas. Coal gas was first produced on customer’s premises but later evolved into gasification plants that enjoyed economies of scale. In the industrialized world cities had networks of piped gas, used for lighting. But gas lamps produced poor light, wasted heat, made rooms hot and smoky, and gave off hydrogen and carbon monoxide. In the 1880s electric lighting soon became advantageous compared to gas lighting. Electric utility companies took advantage of economies of scale and moved to centralized power generation, distribution, and system management. With long distance power transmission it became possible to interconnect stations to balance loads and improve load factors. In the United Kingdom, Charles Merz, of the Merz & McLellan consulting partnership, built the Neptune Bank Power Station near Newcastle upon Tyne in 1901, and by 1912 had developed into the largest integrated power system in Europe. Merz was appointed head of a Parliamentary Committee and his findings led to the Williamson Report of 1918, which in turn created the Electricity Supply Bill of 1919. The bill was the first step towards an integrated electricity system. The Electricity (Supply) Act of 1926 led to the setting up of the National Grid. The Central Electricity Board standardized the nation's electricity supply and established the first synchronized AC grid, running at 132 kilo volts and 50 Hertz. This started operating as a national system, the National Grid, in 1938. In France, electrification began in the 1900s, with 700 communes in 1919, and 36,528 in 1938. At the same time, the nearby networks began to interconnect: Paris in 1907 at 12kV, the Pyrénées in 1923 at 150 kV, and finally almost all of the country interconnected in 1938 at 220 kV. By 1946, the grid is the world's most dense. That year that state nationalized the industry, by uniting the private companies as Électricité de France. The frequency was standardized at 50 Hz, and the 225kV network replaces 110 and 120. From 1956, household current is standardized at 220 / 380V, replacing the previous 127/220V. During the 1970s, the 400kV network, the new European standard, is implemented. The wide area synchronous grids of Europe. Most are members of the European Transmission System Operators association. 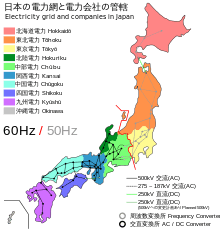 Map of Japan's electricity transmission network, showing differing systems between regions. Unusually for a national grid, different regions run at completely different frequencies. Grids are designed to supply voltages at largely constant amplitudes. This has to be achieved with varying demand, variable reactive loads, and even nonlinear loads, with electricity provided by generators and distribution and transmission equipment that are not perfectly reliable. In a synchronous grid all the generators are connected in parallel and run not only at the same frequency but also at the same phase. Each generator is maintained in this state by a local governor that regulates the driving torque by controlling the steam supply to the turbine driving it. Generation and consumption must be balanced across the entire grid, because energy is consumed almost instantaneously as it is produced. Energy is stored in the immediate short term by the rotational kinetic energy of the generators. Although an entire grid runs at the same frequency, normally only in very small grids is the frequency fixed. More typically, the frequency of the grid is designed to vary slightly (by 1 percent or so) depending on the load on the grid. When the grid is very heavily loaded, the frequency slows, and governors adjust their generators so that more power is output (droop speed control). When the grid is lightly loaded the grid frequency runs above the nominal frequency, and this is taken as an indication by Automatic Generation Control systems across the network that generators should reduce their output. In addition, there's often central control, which can change the parameters of the AGC systems over timescales of a minute or longer to further adjust the regional network flows and the operating frequency of the grid. A wide area synchronous grid or "interconnection" is a group of distribution areas all operating with alternating current (AC) frequencies synchronized (so that peaks occur at the same time). This allows transmission of AC power throughout the area, connecting a large number of electricity generators and consumers and potentially enabling more efficient electricity markets and redundant generation. 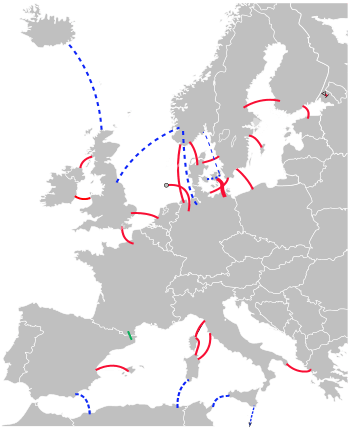 Interconnection maps are shown of North America (right) and Europe (below left). A town is only said to have achieved grid connection when it is connected to several redundant sources, generally involving long-distance transmission. This redundancy is limited. Existing national or regional grids simply provide the interconnection of facilities to utilize whatever redundancy is available. The exact stage of development at which the supply structure becomes a grid is arbitrary. Similarly, the term national grid is something of an anachronism in many parts of the world, as transmission cables now frequently cross national boundaries. The terms distribution grid for local connections and transmission grid for long-distance transmissions are therefore preferred, but national grid is often still used for the overall structure. Electric utilities across regions are many times interconnected for improved economy and reliability. Interconnections allow for economies of scale, allowing energy to be purchased from large, efficient sources. Utilities can draw power from generator reserves from a different region in order to ensure continuing, reliable power and diversify their loads. Interconnection also allows regions to have access to cheap bulk energy by receiving power from different sources. For example, one region may be producing cheap hydro power during high water seasons, but in low water seasons, another area may be producing cheaper power through wind, allowing both regions to access cheaper energy sources from one another during different times of the year. Neighboring utilities also help others to maintain the overall system frequency and also help manage tie transfers between utility regions. As the 21st century progresses, the electric utility industry seeks to take advantage of novel approaches to meet growing energy demand. Utilities are under pressure to evolve their classic topologies to accommodate distributed generation. As generation becomes more common from rooftop solar and wind generators, the differences between distribution and transmission grids will continue to blur. Also, demand response is a grid management technique where retail or wholesale customers are requested either electronically or manually to reduce their load. Currently, transmission grid operators use demand response to request load reduction from major energy users such as industrial plants. With everything interconnected, and open competition occurring in a free market economy, it starts to make sense to allow and even encourage distributed generation (DG). Smaller generators, usually not owned by the utility, can be brought on-line to help supply the need for power. The smaller generation facility might be a home-owner with excess power from their solar panel or wind turbine. It might be a small office with a diesel generator. These resources can be brought on-line either at the utility's behest, or by owner of the generation in an effort to sell electricity. Many small generators are allowed to sell electricity back to the grid for the same price they would pay to buy it. Furthermore, numerous efforts are underway to develop a "smart grid". In the U.S., the Energy Policy Act of 2005 and Title XIII of the Energy Independence and Security Act of 2007 are providing funding to encourage smart grid development. The hope is to enable utilities to better predict their needs, and in some cases involve consumers in some form of time-of-use based tariff. Funds have also been allocated to develop more robust energy control technologies. The electrical grid is expected to evolve to a new grid paradigm: the smart grid, an enhancement of the 20th century electrical grid. The traditional electrical grids are generally used to carry power from a few central generators to a large number of users or customers. In contrast, the new emerging smart grid uses two-way ﬂows of electricity and information to create an automated and distributed advanced energy delivery network. Many research projects have been conducted to explore the concept of smart grid. According to a newest survey on smart grid, the research is mainly focused on three systems in smart grid- the infrastructure system, the management system, and the protection system. In the transition from the conventional power grid to smart grid, we will replace a physical infrastructure with a digital one. The needs and changes present the power industry with one of the biggest challenges it has ever faced. A smart grid would allow the power industry to observe and control parts of the system at higher resolution in time and space. It would allow for customers to obtain cheaper, greener, less intrusive, more reliable and higher quality power from the grid. The legacy grid did not allow for real time information to be relayed from the grid, so one of the main purposes of the smart grid would be to allow real time information to be received and sent from and to various parts of the grid to make operation as efficient and seamless as possible. 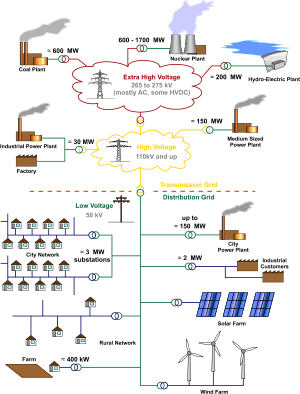 It would allow us to manage logistics of the grid and view consequences that arise from its operation on a time scale with high resolution; from high-frequency switching devices on a microsecond scale, to wind and solar output variations on a minute scale, to the future effects of the carbon emissions generated by power production on a decade scale. The management system is the subsystem in smart grid that provides advanced management and control services. Most of the existing works aim to improve energy efﬁciency, demand proﬁle, utility, cost, and emission, based on the infrastructure by using optimization, machine learning, and game theory. Within the advanced infrastructure framework of smart grid, more and more new management services and applications are expected to emerge and eventually revolutionize consumers' daily lives. The protection system is the subsystem in smart grid that provides advanced grid reliability analysis, failure protection, and security and privacy protection services. The advanced infrastructure used in smart grid on one hand empowers us to realize more powerful mechanisms to defend against attacks and handle failures, but opens up new vulnerabilities. For example, National Institute of Standards and Technology pointed out that the major benefit provided by smart grid, the ability to get richer data to and from customer smart meters and other electric devices, also give major privacy concerns, since the energy use information stored at the meter acts as an information-rich side channel. This information could be mined and retrieved by interested parties to reveal personal information such as individual's habits, behaviors, activities, and even beliefs. The Rocky Mountain Institute has proposed that there may wide scale grid defection. This is backed up by studies in the Midwest. ↑ Mr Alan Shaw (29 September 2005). "Kelvin to Weir, and on to GB SYS 2005" (PDF). Royal Society of Edinburgh. ↑ "Lighting by electricity". The National Trust. ↑ Abdelhay A. Sallam and Om P. Malik (May 2011). Electric Distribution Systems. IEEE Computer Society Press. p. 21. ISBN 9780470276822. ↑ "Industry Cross-Section Develops Action Plans at PJM Demand Response Symposium". Reuters. 2008-08-13. Retrieved 2008-11-22. Demand response can be achieved at the wholesale level with major energy users such as industrial plants curtailing power use and receiving payment for participating. ↑ "U.S. Energy Independence and Security Act of 2007". Retrieved 2007-12-23.